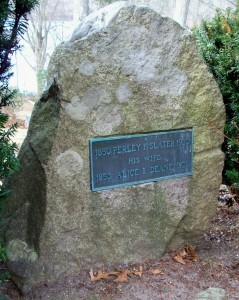 Died: December 8, 1928 in Bourne Ma. at 75 yrs, 9 mos. 1. George Raymond Slater; (January 31, 1873 – ? ); Married (1) Alice Williams Bumpus (1877 – ?) (Samuel S. Bumpus & Elizabeth Barney Williams) in Fairhaven Ma. on January 31, 1895 (they divorced) & married (2) Willhelmina Caroline Peterson Wright (1870 – 1956) (Lars Peterson & Anna Svenson) on May 22, 1911; Willhelmina married (1) Noah H. Wright (1845 – 1907) (Stillman Wright & Zilpha E. Hammond) in Falmouth Ma. on April 16, 1900; Noah married (1) Sarah Small (1846 – 1897) (David Small & ?) in 1864 & married (2) Bernice M. Hall (1873 – 1899) (John H. Hall & Mary P. Nye) in Falmouth Ma. on June 1, 1899; Noah & Sarah are buried in Pocasset Cemetery; Bernice is in North Falmouth Cemetery. 2. Annie Maria Slater Bothfield; (February 2, 1879 – April 28, 1939); Married Rudolph Otto Bothfield (1882 – ?) (Franz Otto Bothfield & Clara M. Louise Heinigke) in Cataumet Ma. on November 28, 1912; Annie is buried in Cataumet Cemetery.